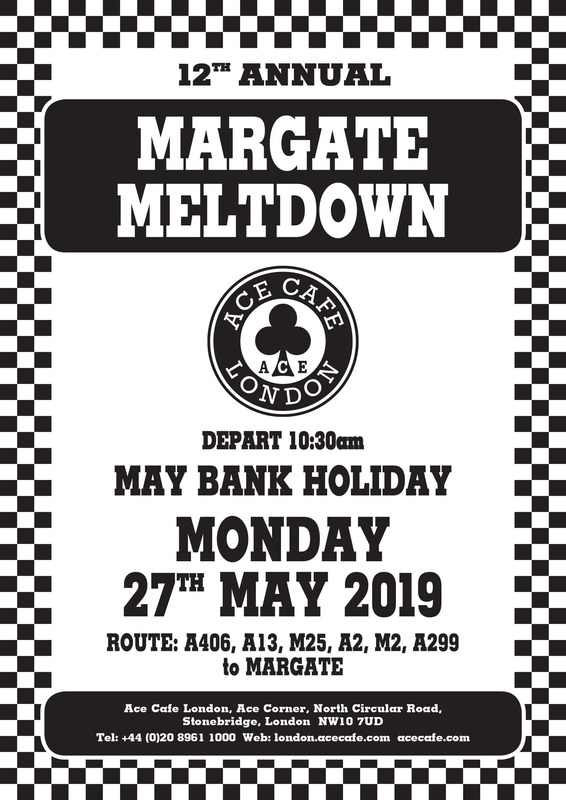 The 12th annual Margate Meltdown is the most recently established of Ace Cafe London’s free to attend major ride outs. The ride out from the cafe to this popular seaside resort in Kent has been held each year on occasion of the annual Spring Bank Holiday. Margate seafront and harbour is given over to motorcycles and scooters, diverse club and trade stands, a stage with live entertainment from Noon, together with rockin’ DJ Bill Guntrip. Working closely with the cafe’s chosen charity for this event, The Royal British Legion Riders Branch (RBLRB), the town and Thanet District Council, Margate not only has everything that a great ride out requires, but also a great beach and plenty of heritage to include a legacy from the 1960s that is of world renown relating to motorbikes, scooters and the Mods & Rockers that rode them!